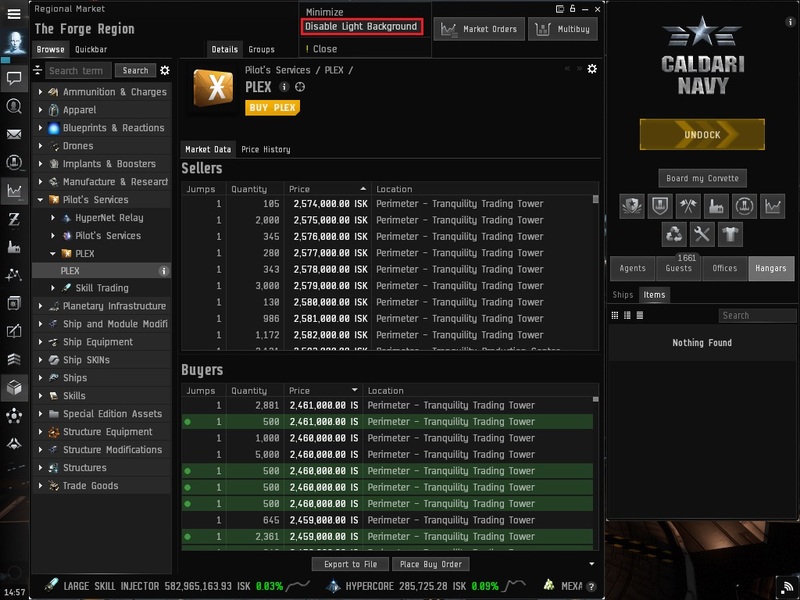 Market orders manipulation (buy low, sell high) is by far the fastest and safest method of making billions of ISK in Eve Online! The "TinyTrader" Standalone Add-on for the "TinyMiner Eve Online Mining Bot" takes care of adjusting your Buy and Sell market orders so that they are always on top for as many Eve Online clients as you want (for example one in each major trading hub)! Never again will your orders get undercut by 0.01 ISK, this time you'll automatically undercut them right back and your orders will be fulfilled faster than ever! Click to see the Full Size screenshot! The market window needs to be sized and positioned like in the screenshot above, stretching all the way from top to bottom and from the "Neocom" to the "Station Services" window to make use of maximum space on screen. Don't forget to set the Eve Online window size to "1024x768" in Eve General Settings! You need to set the "Ctrl-M" keyboard shortcut for opening the "Regional Market"! Make sure your Eve Online theme is set to "Carbon" (requires Omega clone)! In the "Details" tab sort orders by "Price", ascending for "Sellers" and descending for "Buyers"! - "Undercut lowest sell order by a random amount from" - Pretty self explanatory, this option allows you to choose a random value from a specified interval and use that value to modify your own market orders to undercut the lowest sell order for each item you're selling. - "Raise your buy orders by a random amount from" - Same as above, only for buy orders you will increase their value in order to move on top of the highest buy order for each item you're buying. - "Ignore SELL orders farther than X jumps away from the current station" - Most of the time, stations that are farther away from central hubs like Jita, will have lower prices for their items but nobody will bother to travel there to buy them so you don't want to lower your prices below theirs! Set this value to "-1" to only take into account the current station you're docked in (Jita 4-4 for example) or to "0" to extend the range to the current solar system! - "Ignore BUY orders with a range outside the reach of the current station" - Same as above you don't want to raise the prices of your own buy orders over other buy orders that can't be fulfilled from the current station anyway! - "Ignore orders with a quantity lower than X% of your own" - Sometimes you will buy or sell large quantities of items in each stack (hundreds or thousands) and someone will come with a small order of only one or a few items in order to bait you into undercutting them or simply because they don't have or need many of those items. Enable this option to prevent that trick or set it to "0" to disable it! - "Stop udating orders if the price difference exceeds X%" - Sometimes other players are willing to sell items at a loss or buy them for too much. If you are not willing to match their prices, this option will prevent you from losing ISK. If the price difference based on the original starting price of each of your own orders exceeds this percentage then TinyTrader will stop updating those orders until the market values bounce back! 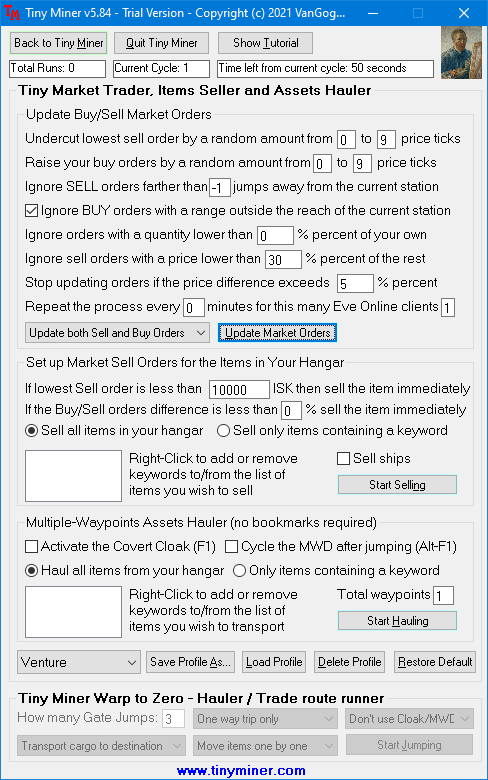 - "Repeat the process every X minutes for this many Eve Online clients" - Eve Online market orders can be adjusted every 5 or more minutes so you can specify your desired interval here to check whether your orders are still on top or they need to be adjusted accordingly. You can also specify if you wish to perform this operation for more than one Eve Online client (for example if you have a character logged in every major trade hub)! - "Orders Updating Options" - Select from the drop-down list whether you want to update only your "Sell Orders", only your "Buy Orders" or both "Sell and Buy Orders". - "If lowest Sell order is less than X ISK then sell the item immediately" - Since the number of Sell orders is limited by your skill, it may not be worth setting up sell orders for items that are very cheap. You can choose to sell such items immediately to the highest Buy order without creating a Sell order for them! - "If the Buy/Sell orders difference is less than X% sell the item immediately" - Sometimes the top Buy and Sell orders for a certain item are too close to make it worthwhile to create a Sell order when you take taxes into account so you can use this option to dump your items on top of the highest Buy order! - "Sell all items in your hangar" or "Sell only items containing a keyword" - By default TinyTrader will set up Sell orders for all items in your hangar. Using this option you can choose only those items containing keywords you specify in this list (such as: "Veldspar", "Scordite", etc)! - "Sell ships" - If you check this option you can sell packaged ships from the "Ships" tab instead of regular items from the "Items" tab! - "Activate the Covert Cloak (F1)" - If your ship is properly equipped, TinyTrader will press "F1" to activate the covert ops cloaking device after each gate jump to make sure your cargo arrives to your destination in the safest possible way! This option is great for blockade runners and other cloaky ships! - "Cycle the MWD after jumping (Alt-F1)" - If your ship is properly equipped, TinyTrader will press "Alt-F1" to cycle the microwarpdrive module after each gate jump to help your ship initiate warp faster! This option is great for Orcas and other slow ships with an align time greater than 10 seconds (one microwarpdrive cycle)! - "Haul all items in your hangar" or "Only items containing a keyword" - By default TinyTrader will transport all items in your hangar. Using this option you can choose only those items containing keywords you specify in this list (such as: "Veldspar", "Scordite", etc)! - "Total waypoints" - Before starting the Assets Hauler you need to add a waypoint for each station along the route where you want to pick up items to haul. The last waypoint will be your destination station (such as Jita 4-4 for example)!